This week, 14-year Ahmed Mohammed was led away from school in handcuffs after police and school officials thought his homemade clock looked like a bomb. You probably heard about it, as I did, on Facebook or Twitter. I find so many aspects of this story appalling. A bright kid with a passion for engineering — the kind of kid we should be celebrating — was humiliated and outrageously accused. Americans are increasingly skeptical of science. It seems now that we’re feeling threatened by science as well. Worse, none of the supposed grownups in the story bothered to learn the truth. Confronted with the truth — Ahmed insisted all along that the device was a clock — they chose to persist in their ignorance. Worst of all, Ahmed was singled out because he has brown skin and a Muslim name. Don’t tell me he wasn’t. He never would’ve been handcuffed if he’d looked like Wally Cleaver and his name had been Josh or Ryan. Say what you want about this episode. It showed people — educators and police officers, the very people who should know better — behaving at their absolute worst. Here’s the thought that echoed the loudest to me: The war on terror is over. Terror has won. It’s turned us into a nation of ignorant, paranoid xenophobes. Except that I’m not ready to throw in the towel. I can’t. Maybe it’s because I’ve made my career in technical communication — pushing back ignorance, helping people understand and benefit from science and technology. Maybe it’s simply because I can’t live with the idea that American society has come to such a sorry state. Happily, I know I’m not alone, because I saw the shitstorm that erupted on social media after Ahmed’s story got out. Twitter blazed with #IStandWithAhmed — hundreds of thousands of people expressing support for Ahmed and for STEM, while condemning the ignorance and bigotry shown by the officials. 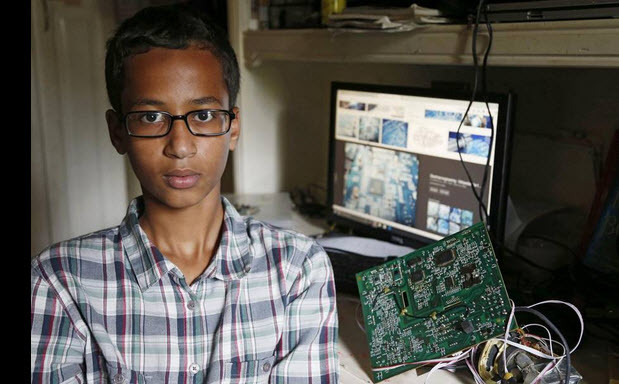 President Barack Obama tweeted “Cool clock” and invited Ahmed to the White House. Hillary Clinton contributed this: Assumptions and fear don’t keep us safe — they hold us back. That sums it up perfectly. On 9/11 a group of terrorists made us fear for our safety. Since then that fear has been amplified — not so much by events that have happened, as by the way we as a society have reacted. How do we get our safety back? We have to choose. Do we make assumptions based on ignorance, or do we seek the truth? Do we let our fears guide us, or do we act confidently, based on what we know to be true? I choose the truth. I choose confidence. Does that mean I’m never afraid, never misinformed? No. It means I don’t take action (or fail to act) because of my fear and my ignorance. If you’re with me, it’s time to speak up. You need to make your voice heard. Because we’re better than this. We have to be. This entry was posted in Society, Technical communication and tagged Ahmed Mohamed, choose, confidence, fear, ignorance, social media on September 17, 2015 by Larry Kunz.